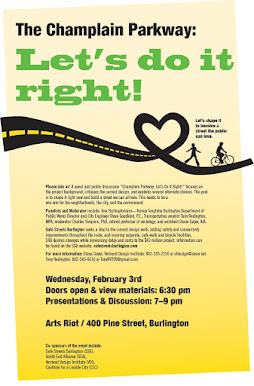 SAFE STREETS BURLINGTON: Pine Street Coalition Tells State and Feds--Time for a New Community Parkway Design Process! Pine Street Coalition Tells State and Feds--Time for a New Community Parkway Design Process! last publicly evaluated by federal and state regulators ten years ago. designs that Federal Highway Administration (FHWA) documents say are significantly less safe. Coalition’s efforts. “The Parkway would cut off the Pine Street corridor, and prevent planned future development in the City’s Enterprise Zone,” Goodkind added. expert Dr. Charles Simpson. The Pine Street Coalition cites a lack of agency outreach, as well as an absence of aesthetic and noise impact analysis in the Maple-King Street community. within 90 days, the Pine Street Coalition says it will file action in federal court this summer. Reversing dead-ending of Pine Street at the Parkway Current design dead-ending worsens the nearby single-lane bridge, cuts Queen City Park road access and linkages to the Industrial Avenue and South Burlington points. The I 189 segment for years used for commuter parking, children bike riding and dog walks Some can be retained as a two-lane road allows a linear transit or park 'n ride facility. From Home Ave. to Flynn Ave. the Parkway converted from two segregated streets, becoming a single, quality and safe “complete street.” Melding Briggs and Batchelder into a single street with full connectivity possible for City Market and Petra Cliffs (no vehicle access to Morse, Lyman and Ferguson). The “Parkway” ends at Flynn Ave. The original “Purpose and Need” to speed traffic downtown no longer serves the City or is possible with moving the railyard abandoned. The objective of shifting trucks off local streets to the industrial areas still occurs. The natural areas of Englesby Brook now preserved and two acres of prime development land at Glbane recovered for businesses and associated jobs. The Gilbane property and Innovation Center now become an overall “Lakeside Innovation Zone.” Guidelines affirm the value of the energy and industrial innovation enclave which mark the area from its earliest days. This “innovation enclave” engages with the City's food hub and energy production as a common goal. Safe and separate walk and bike routes Walk/bike quality facilities along the Pine Street corridor serve the neighborhood, commuters, and feature a focus on “safe routes to school”, thereby becoming a complete street with “low stress” bikeways. Stormwater infiltration Mechanisms for stormwater include rain gardens, soils remediation and open space protection on the Barge Canal as an ongoing remediation site. Pine Street to Main Street With Bicycle Connections: The Tuning Fork Separate from the Parkway project, the Railyard may allow a one way street design west from Curtis Lumber to South Champlain, north to Main Street then return down Pine Street—this allows the addition of a low-stress bike circulation and connector to the Burlington Bikepath. The Southern Connector Project is one piece of a larger transportation plan for Chittenden County that was formulated over 40 years ago. It consisted of a network of highways that would encircle the county through Burlington, South Burlington, Williston, Winooski, Essex and Colchester. Parts of it included existing state highways and the interstate. There were also proposed new roads i.e. the Northern and Southern Connectors and the Circumfential Highway. These proposed new roads share many common characteristics. They were to be for the most part limited access routes that would take traffic from existing local roads and reassign it to these new segments. But just as importantly, they all contained a huge conceptual flaw by relying on the perceived benefits of the ring road concept. .
roads. We have also grown to appreciate the benefits of neighborhood connections that are not separated by manmade barriers such as limited access highways or large development projects. (The Burlington Town Center is an example of the latter case). As a result, only portions of the original plan have been constructed. They are the three “bypass segments”, including the so-called “road to nowhere” in Burlington. The ring road concept is essentially dead. If we hope to be a 21st century city, we need transportation projects that have designs that reflect 21st century thinking, not 20th century throwbacks. 1) At the last minute the Northern Connector Project was modified to end at Manhattan Drive rather than at Battery and Pearl. This was to avoid destroying a good part of the Old North End. 3) About 25 years ago, governor Dean stopped the construction of the Southern Connector from Home to Lakeside because of the uncertainty that a connection to Battery Street could be built. 4) Even though ROW had been secured and some railroad facilities and the DPW offices in its’ path have been relocated, the Southern Connector route from Lakeside to Battery through the Barge Canal was abandoned. 5) The “road to nowhere” was constructed 30 years ago but never completed and never maintained. 6) In the 1980’s, South Burlington decided not to participate in a segment of the Southern Connector that would have been in their community. on the side of RETHINKING, REIMAGINING AND REDESIGNING the Southern Connector. It is the smart thing to do! It is not too late!